Ornamental grass makes for very useful additions to any landscape setting. It is equally good for use in sprawling estates and small “postage stamp” yards. The many different varieties of interesting grasses provide an easy way to add color and contrast to a monochrome landscape setting. Grasses are very decorative, and well-placed specimens can create very eye-catching points of interest. Just think of pampas grass Cortaderia selloana planted all in a row, they can define space and provide privacy and windbreak benefits. Switch panic grass or switch grass (Panicum virgatum) – a drought resistant grass that does well under both partial shade and full sun. Blue oat grass (Helictotrichon sempervirens) – a grass ornamental with blue or green leaves that looks great in landscaping due to its color. Karl Foester (Calamagrostis x acutiflora) – one of the most popular feather reed grasses. Hakone grass (Hakonechloa macra) – a deer resistant grass native to Japan. Known for its attractive gracefully arching and slender foliage. Perfect for a landscape garden setting. Beard grass or little bluestem (Schizachyrium scoparium) – a North American grass native in most US states and some parts of Canada-US border. Prairie dropseed (Sporobolus heterolepis) – a clump-forming, warm season. Weeping brown sedge (Carex flagellifera) – a distinctive ornamental grass with golden brown color that grows up to five feet tall. Ribbon grass or reed canary grass (Phalaris arundinacea) – a tall perennial bunch grass distributed widely in Asia, Europe, North Africa and North America. Zebra grass (Miscanthus sinensis) – grows up to 13 feet and forms clumps from a rhizome buried underground. Mexican feather grass (Stipa tenuissima) – grows quickly and naturally through reseeding. Chinese fountaingrass, dwarf fountain grass or swamp foxtail grass (Pennisetum alopecuroide) – warm season, a perennial and ornamental grass native to Asia and Australia. In this article, we will present 10 interesting and easy ways to make the best use of ornamental grasses in your landscape setting. Read on to learn more. Unlike labor-intensive and resource hungry lawn grass, ornamental grass is fairly carefree. They even find success when used in some xeriscape settings. With so many different types of ornamental grasses, you’ll easily find one or more to perfectly suit your setting, yard and garden care habits. Your best bet… seek out ornamental grasses native to your location. The plants will do well in your climate and soil conditions (well-drained soil) with a minimum amount of care. Talk to your local nursery or local native plant society to learn about the native and grasses for your area. You may think grass is not a good choice if you have a small courtyard, deck or balcony space. However, many ornamental grasses (Pennisetum setaceum) do very well as container and bedding plants. Plant individual specimens in large containers for stunning focal points, or create a mini meadow in a small garden bed. These planting can provide privacy screening and make an interesting conversation piece in a seating area. Tall, fast-growing ornamental grasses makes excellent choices for softening high winds and noises in an urban setting. Create an excellent windbreak by planting a bank of tall ornamental grass along the perimeter of your patio or deck. The presence of greenery makes any setting more comfortable and inviting. NOTE: When selecting grasses check how aggressive or invasive the grass is such as Miscanthus sinensis ‘Gracillimus’ the Maiden grass. Tall, feathery ornamental grasses such as Feather Reed Grass make an excellent privacy screen. During the spring and summer months, growth is thickest . This grass tends to thin during winter or cool seasons. You’ll get more light and warmth with thinner growth. Feather Reed Grass is an excellent choice for a patio setting in most areas of the US. In fact, it is hardy from USDA zones 3 through 9. This type of grass grows very tall but not wide. This makes it an excellent choice for smaller and more confined spaces. Ornamental grasses come in a number of different sizes and configurations. Wider, low growing grass-like plants such as Mexican Feather Grass make a nice border along walkways and driveways. Create interesting visual effects by combining this type of low growing grass in combination with taller grass. As low growing grasses go, Mexican Feather Grass is a good choice in warmer, drier settings. It’s very hardy and drought tolerant in zones 6 through 10. CAUTION: Careful when planting this grass along the West Coast (i.e. in California and Oregon). Mexican Feather Grass can reseed on its own. You must stay on top of it and pull it up when it volunteers in unwanted areas. Carefully keep it under control in west coast states as it can become invasive. To avoid this problem altogether, you could plant an alternative. The University of California Master Gardening Program suggests California Native Blue Grama Grass or California Native Prairie Grass. Other low growing, non-invasive possibilities include Mexican Deer Grass, Pink Muhly Grass and Northern Sea Oats (Chasmanthium latifolium) . Easily add interest and several seasons of color using ornamental grasses. Most are easy to grow and attract wildlife. Some varieties handle a wide range of growing conditions, have colorful seed heads and add height in container gardens. Every day, homeowners realize that lawn grass maintenance schedules can drain time and resources. Luckily, there are attractive alternatives to planting a lawn. A better choice… filling a front yard with interesting, easy care ornamental grasses. When planting with these hardy, attractive, resource saving alternatives, you won’t need to mow. With ornamental grasses, a little pruning from time to time will do. When you choose drought-tolerant specimens, watering will be minimal or even nonexistent. Create a quiet and private space by planting taller grasses in front of your front porch or around your patio. Use tall grasses as an alternative to fencing… they never need painting or maintenance. In early spring and summer, thick, lush growth provides privacy and shade. When grasses die back in the winter, you’ll get more light and more warm. Little Bluestem is a good choice for this use. It’s hardy throughout most of the US (zones 2A through 9B), very easy to care for and native to most of North America. Little Bluestem grows easily from seed, and tolerates drought conditions. Want to dress up older barns or outbuildings on your property? Plant an attractive ornamental grass such as Purple Fountain Grass around the perimeter to create a stylish rustic look. Purple Fountain Grass known as Fairy Tale Grass is hardy and very colorful. One of the warm-season grasses that grows remarkably well in zones 8B through 11. Other good choices for this type of use are Rubrum and Fireworks. Add interest and soften a visually boring spaces (e.g. a long stretch of plain wall) with ornamental grasses that produce feathery, fluffy fronds. This type of grass is excellent to use for softening harsh edges and lessening an industrial sort of appearance. In areas where you don’t want to have to cleanup petals of many flowers (e.g. around your pond) colorful ornamental grasses are an excellent choice. For example, noninvasive Pink Muhly Grass produces gorgeous, pink feathery fronds throughout the late summer and into the autumn. It can brighten the space around your pond without causing a labor-intensive cleanup problem. It grows in small, easy-to-control clumps and it is hardy in zones 7 through 9. Throw out regular lawn maintenance by planting low growing types of Native Sedge to create an interesting textured meadow. These kinds of grasses make an excellent, low maintenance groundcover adding interest to your yard and providing a natural habitat for native fauna. One excellent choice for low growing Native Sedge is called Carex (aka: California Meadow Sedge). This is a native grass from the West Coast throughout the US and into Canada. In areas other than the West Coast, the Texas native known as Kaplan Sedge is a fine choice. It is hardy through zones six. In the central US and along the East Coast, Pennsylvania Sedge and Baltimore Sedge are very fine choices. Additional Tips On Preparing Your Ornamental Grass For The Growing Season! Just as the lawn needs to get ready for spring growing season so do our ornamental grasses. In this video, Dave from Growing Wisdom shows you how he prepares his collection of ornamental grass for spring! He provides tips on trimming the grasses down and dividing them. When you make the smart choice of adding ornamental grasses to your landscape design, you will soon find that you have more time to enjoy your yard as you’ll spend less time and labor on it. Additionally, you’ll save on water, fertilizer and other costly amendments turf needs. Collecting these interesting, carefree plants is a win-win for any yard and garden setting. 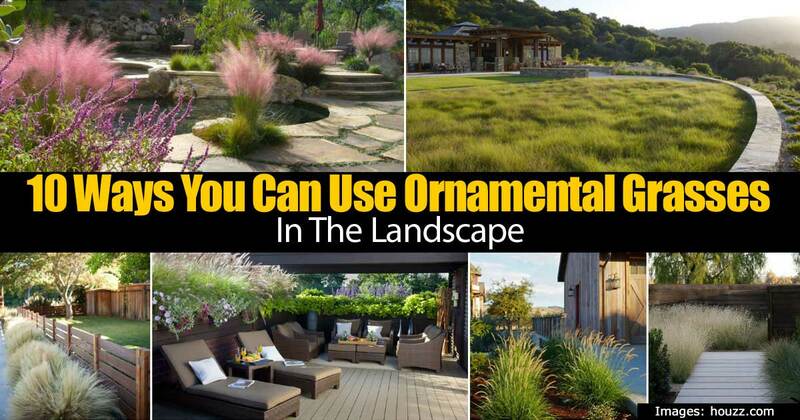 For tips on choosing an ornamental grass and more via houzz and MidwestLiving.